Wow. 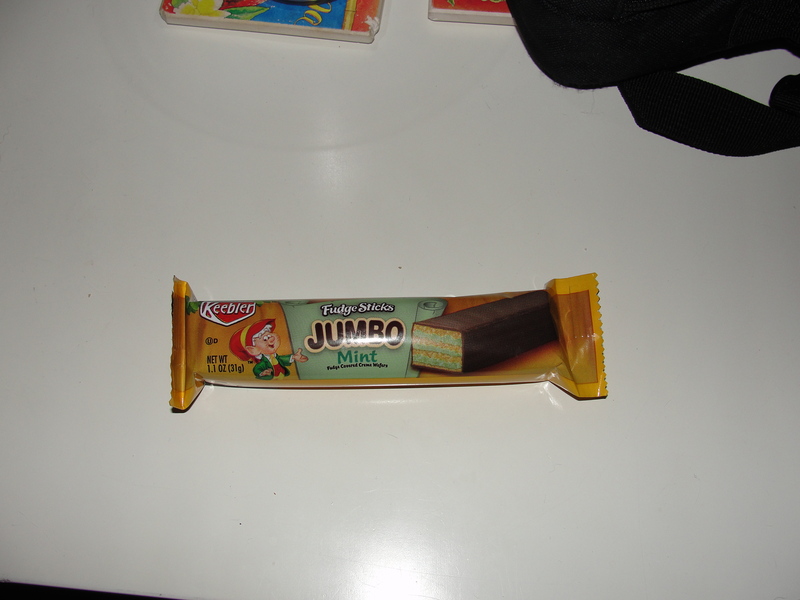 Last night I tried, for the first time, a Keebler Jumbo Mint Fudge Stick. It was shockingly delicious and the perfect Minty Ending to My Day. I’m not sure why I was so surprised with how good it was. Those elves that risk their lives baking in trees, always produce a good product and, I am happy to report that this new release is no different. The only thing that could have possibly made this better was if it was refrigerator. But, I am getting way ahead of myself. Let’s begin at the beginning. I purchased these Mint Sticks when Keebler was BOGO at Publix last week. We have had the Peanut Butter Sticks in the past and really enjoyed them. I figured these Mint Sticks would be just as good and fun to try. And if not, at least they were a BOGO deal. Last night was the first time that I had tried one and now I wish I would have had one sooner. I have these in the pantry currently but, as I mentioned, I think the taste would only improve in the refrigerator. I opened up the Mint Stick and smelt mint right away. This did concern me as I was fearing the artificial flavor of mint would be the only flavor I tasted. I broke the stick in half, and after taking a photo, began to eat. As I bit into the stick, my mouth was hit with layers of fudge, mint and wafers – a tasty combination my mouth was more than happy to have. I chewed each bite and the three layers of the stick blended together perfectly each and every time. With every bite I felt as if I had perfect amounts of fudge, mint and wafer. The fudge in the stick is more of just a regular milk chocolate as it is neither as strong nor as thick as regular fudge. This is okay because I think the Keebler fudge is plenty tasty in all products and the Mint Stick was no different. 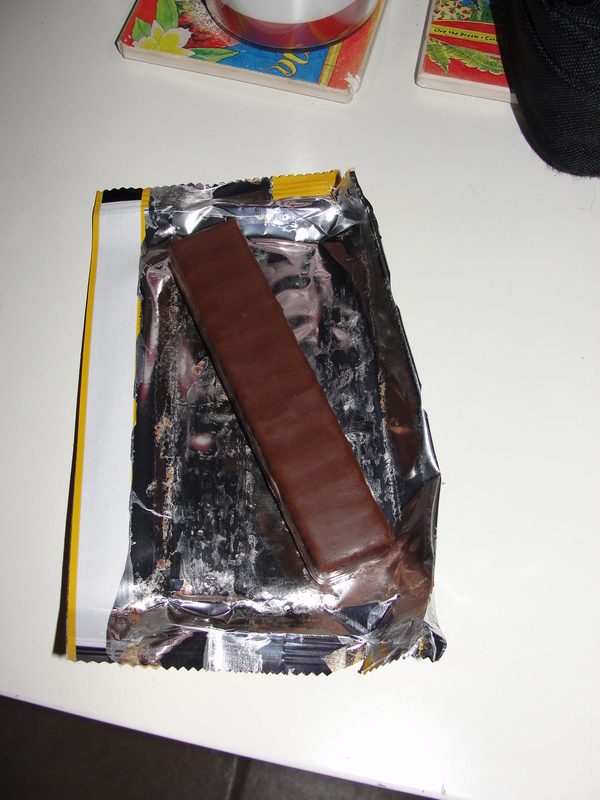 The mint in the stick was in layers and was soft. 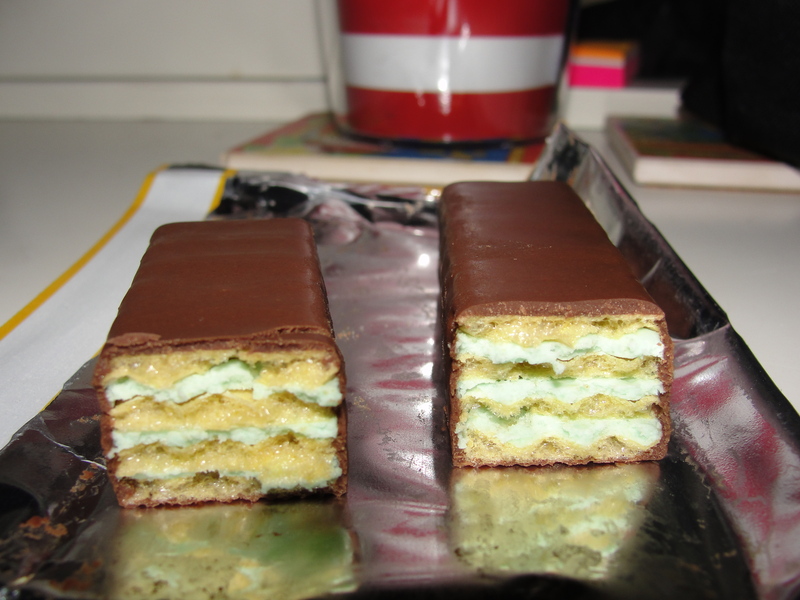 All of the mint flavor was contained in the layers which were bright green. The consistency reminded me of a soft inside of a flavored wafer – creamy and melt-in-your-mouth. The mint in the stick was along the flavor lines of the mint in mint chocolate chip ice cream flavor. The wafers in the stick were thin & crispy – just the way they should be. I quickly finished my mint stick and totally would have been down for another. I plan on putting one in the refrigerator and having it at a later date as a comparison. I think the refrigeration of the fudge and mint would make this treat even more dessert like and more refreshing (if that’s even possible). Once again the Elves risked their lives and came out with a great product. I thank them all for that and can’t wait to continue testing their new products. If you come across their Mint Sticks, grab a box and try them. And, if you haven’t had them before, try the Peanut Butter as well. I guarantee the mint sticks will be the perfect Minty Ending to your Day.